Our brand promise is Out of this World. One of the ways we deliver on that promise is through our instore environment. Right on Ponsonby Road, but a million miles away in hustle and bustle. 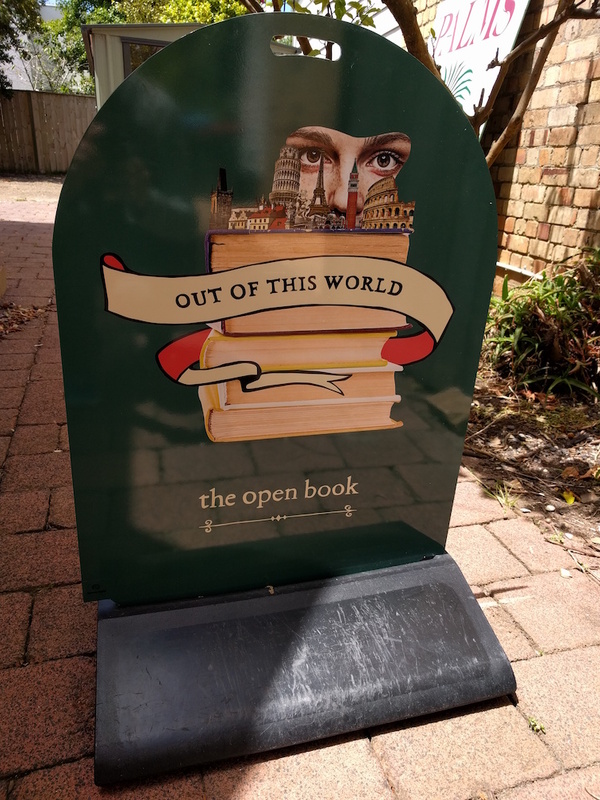 A place where you might want to spend some time, even if you aren't looking for a book. We are at last getting to the end of the physical changes we will make to the store. We have owned it nine months this month. This post is about the before and after, and what turns out to be a long documentation of all of the things. Holy. So many things. I guess even the longest list happens one item at a time. Here is the original wonky walkthrough video I sent to Julie a year ago. And another version I shot just now (I walked a bit quicker the second time soz). Made the place more welcoming, lighter and more open, making it easier to see the books and easier to navigate the nooks, crannies and corridors. Created a lot more places to sit about, started serving coffee and set up free wifi. Transformed the large backyard into a delightful sunny space (except on days like today) with tables and chairs and grass and a hammock. Spent about $10,000 in total. Thirty per cent of that was the front window. Another forty per cent is for assets that we get to keep (furniture and signs, coffee machines). 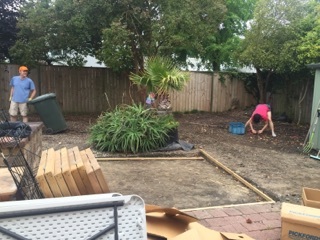 The rest was for our backyard labourers and for hiring skips and other equipment. Now that we can better deliver on the physical promise of the brand, we just need to be telling the story more, enticing a few peeps to take a climb up the steps and come out of the world for a bit. Stick with me now, while I list the changes and put in some pics. Thankfully it is easier to write about them than it was to do them. 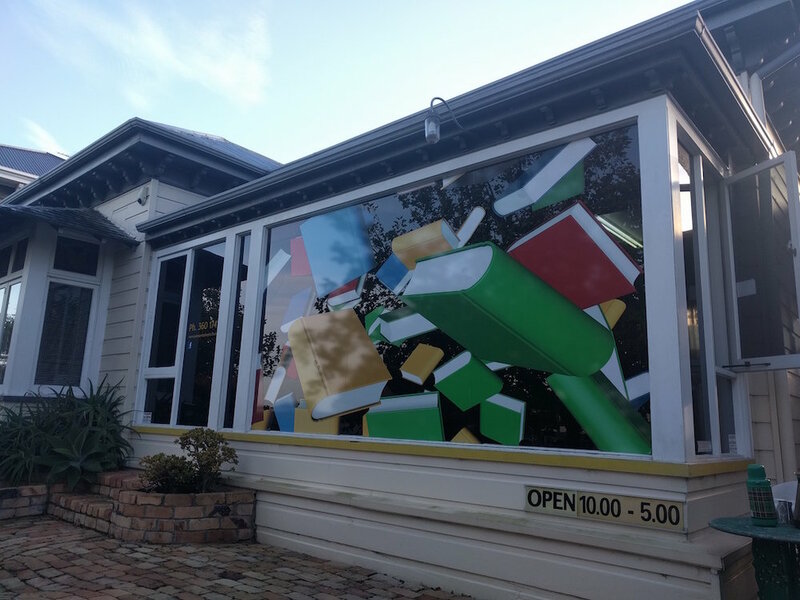 We replaced the dark-tinted front window with clear bi-folds, which means people on the footpath can see in. We open them whenever the weather allows. We split the enormous cost (about $8k) with the landlord because we thought this was an essential change. We made new signs with our new name and identity, and later added some more details underneath the lawn sign so people walking past get a better sense of what this place even is. 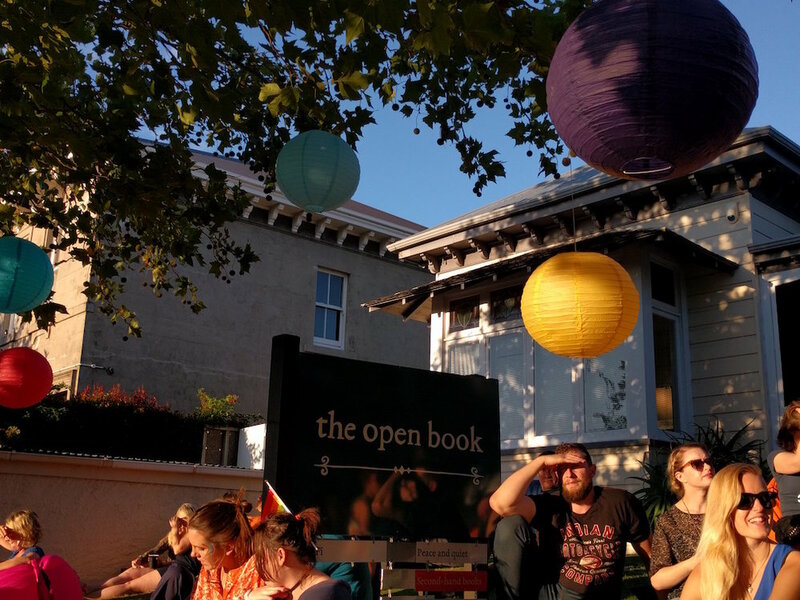 We add bean bags to the front lawn on sunny days to invite people up, and we have festive lanterns in the trees from time to time. 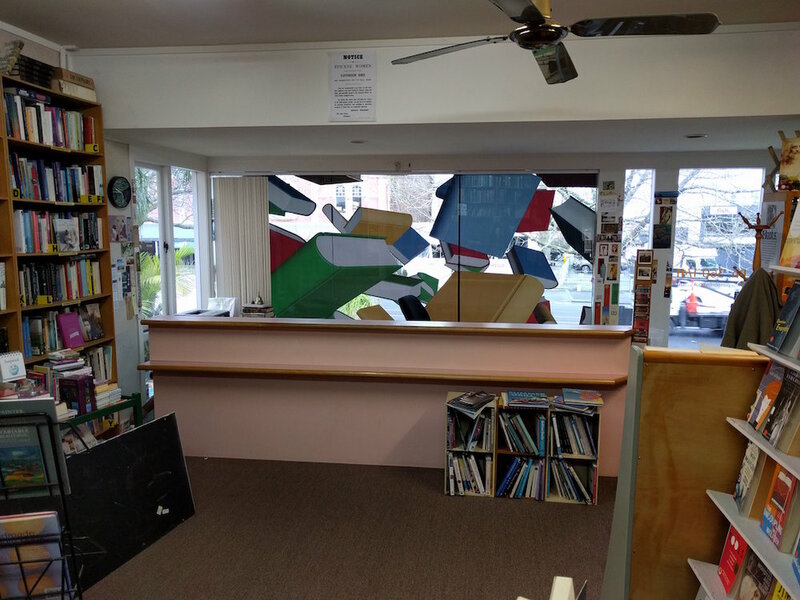 The new window also transforms the front room, making it lighter, more open and more connected to the street. We removed the enormous salmon counter of doom (a four foot high, three metre long barrier to interaction) and replaced it with a narrow folding desk that can be readily moved. This took a long time: we had to get the new point of sale system working first so we could replace the three store computers with just one to give us space, plus move the telephone and power (which were plumbed into the counter). Then the counter itself cottoned on to what was up and resisted the inevitable: we sold it twice, only to have people show up and say that it was too big for them, we disassembled the thing (omg so many screws) only to discover that some parts were too big to put in the skip we hired, so we ended up sawing up the last pieces with a sabre saw. Just last week we at last replaced the last piece of the counter (three horrible pink drawers) with a more appealing kauri cabinet. 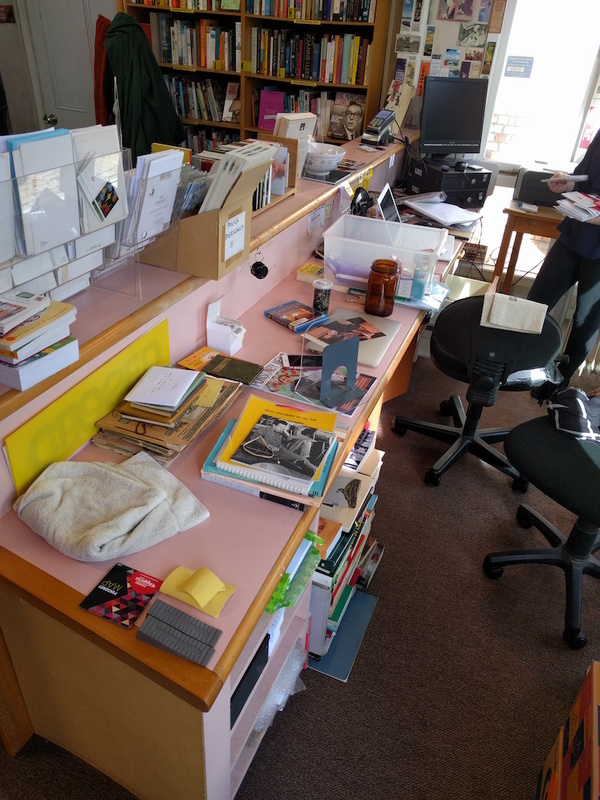 We removed the staff nook that was to the side of the counter, and a bookcase that was filled with books that were yet to be sorted. 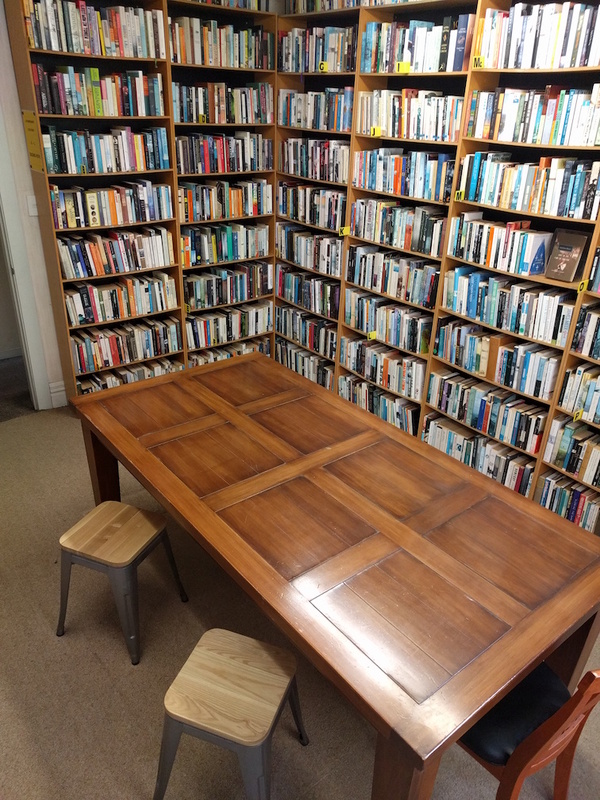 We removed a large round table and some ugly bookcases that drove me crazy every day (because the shelf spacing was too small and inconsistent) and replaced them with a more appealing setup. 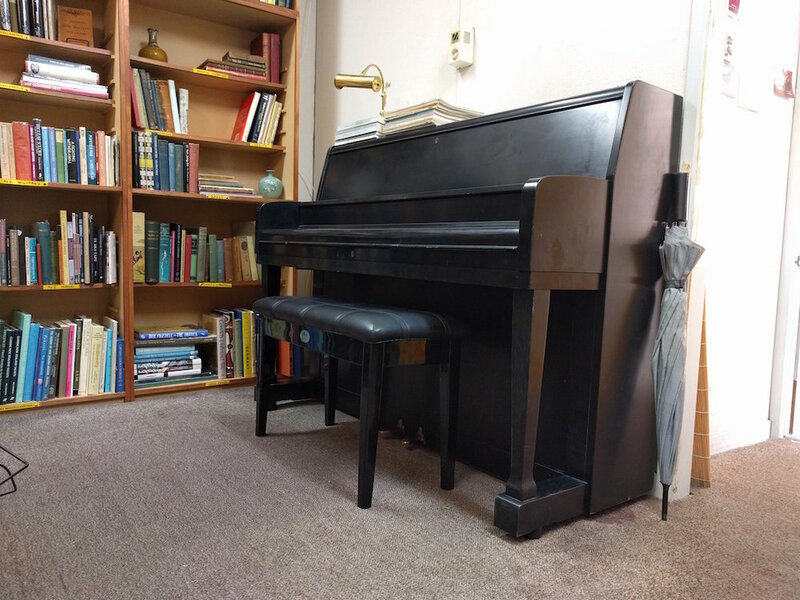 We put in a piano. 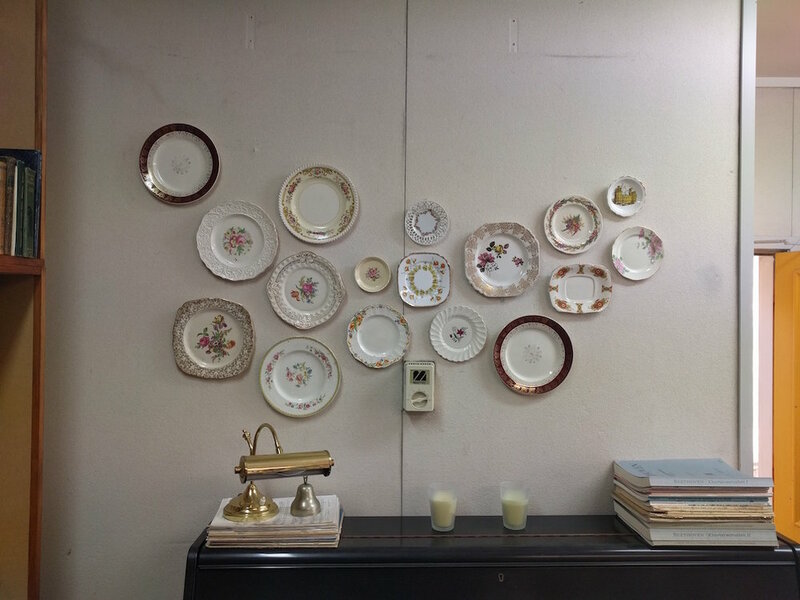 We put some delightful plates on the wall. We also improved the Internet connection and put in free wifi for visitors. Courtesy of some helpful contractors and the generosity of the attendees at two working bees, we took up the old and ugly weed matting, threw out a huge pile of concrete and junk and leaf litter, levelled the ground and planted some grass (at which time I got very good at watering the seeds twice a day). We dug up two shallow pits and put in some beautiful white gravel. On top of these we put tables, umbrellas and chairs. We water-blasted the courtyard paving stones. A grate for the fire is coming (so we can tell scary stories around the fire). Turns out the store had an original brown-tiled bench behind a couple of bookcases. Who knew? 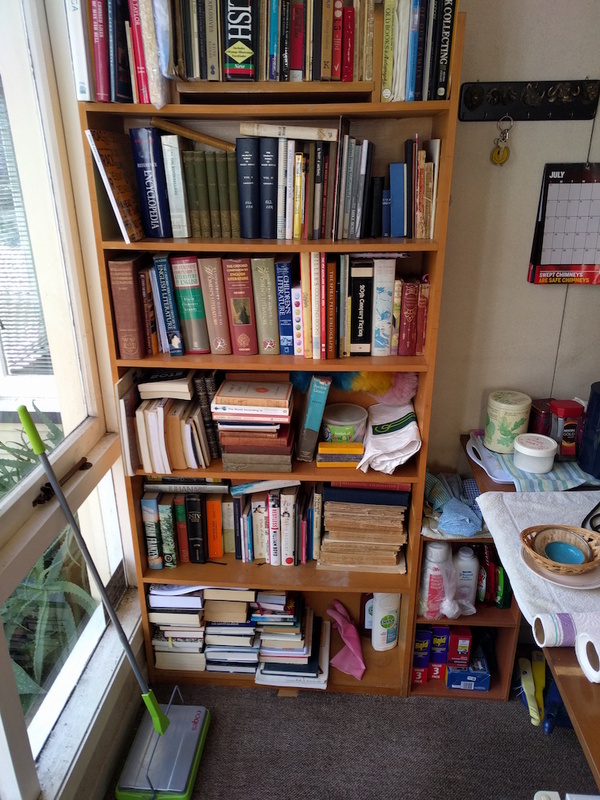 We repurposed the bookshelf beside it to store cups and glassware and plates. We got a coffee machine and some tea pots (a precursor to actually selling these things, imagine: you can get them for free most days at present). We transformed the bathroom, from a dark storage pit (old doors and dirty cardboard in the bath yo) to a light and open space. This is the most recent change. 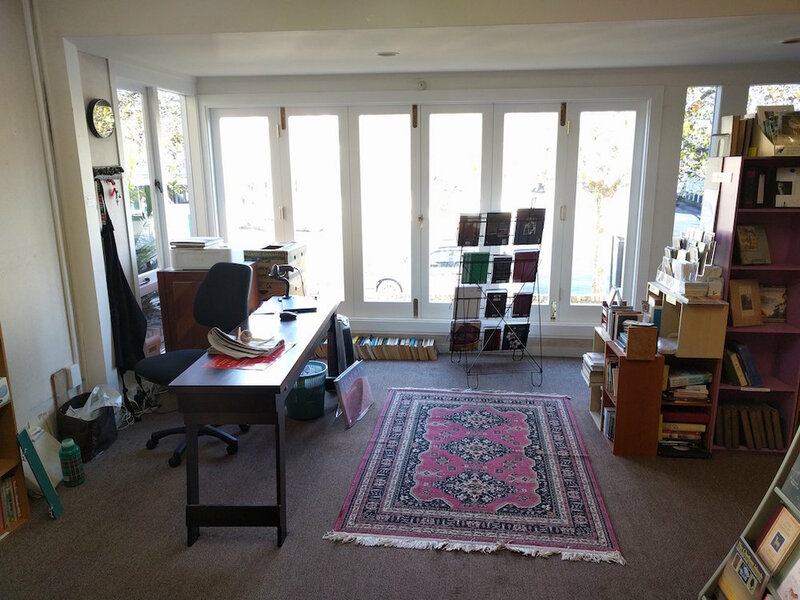 We combined together all the literature in one room, replaced the bookcases that used to crowd the middle of the room with a beautiful table, and moved out the bookcases that have spent the last ten years in front of the bay windows. We bought some beautiful red stools. Now I just need to find a powerpoint (which is reportedly behind one of the towering shelves of books) to plug in a heater. Brrr. 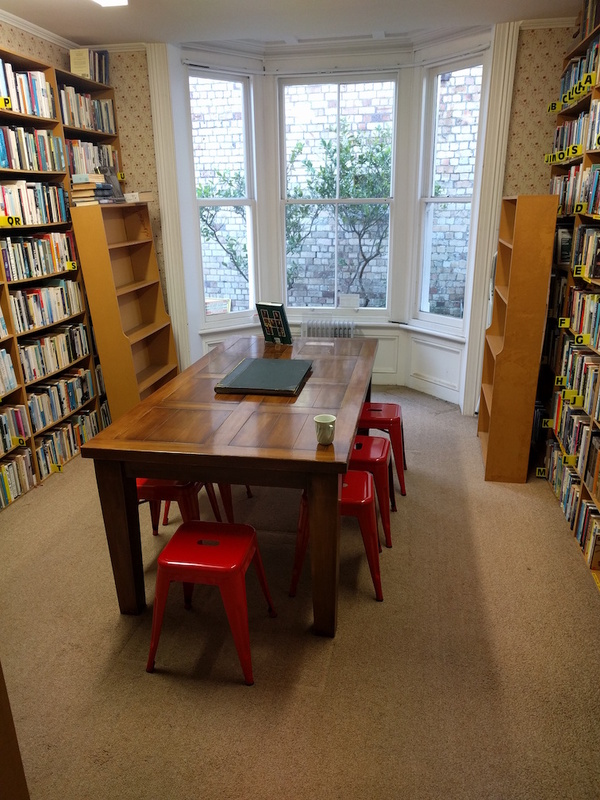 Oh, and we emptied out two random chests of old books in the art room and the little room and replaced them with tables and chairs. To make all this possible, we have had to move a lot of books. Every change is like a logic puzzle (or a yak shave). Travel has been moved twice. Biographies now live by the front window and combine together literary and other into one section. Māori and Pasifika has more space and more visibility in its new room. We have moved kids books into the last room at the back of the store (which was previously all the one dollar books). We moved sport and essays and journalism out of the corridor. So much better. We have gone from about 24,000 books when we started to about 20,000 now. A banana box fits about 40 books, so that 4,000 is 100 banana boxes. We have tried to lift quality and improve visibility of the books, and along the way get to know them better. 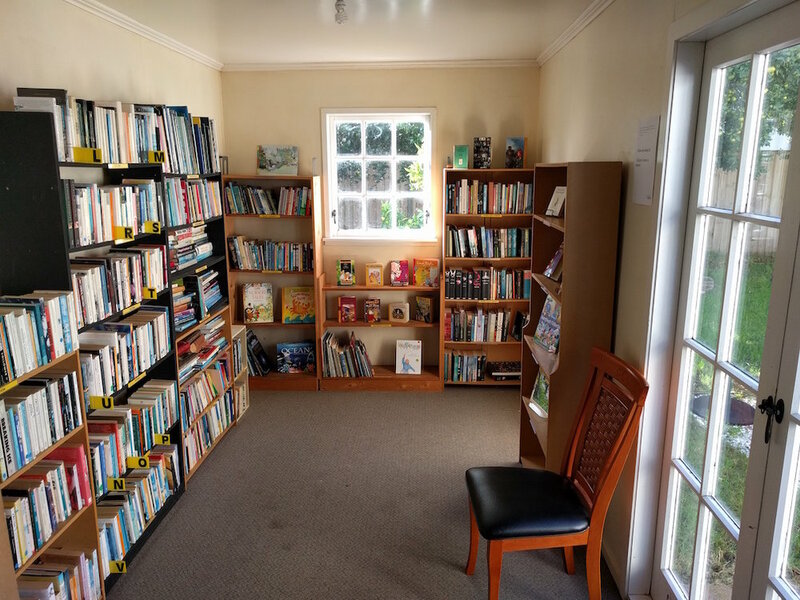 We reordered the collectible books by genre (previously they were stored by shelf, which made it easy for us if they were ordered online but meant nothing to customers). Now people in store can look through them. And we changed the incoming books system so that books are on shelves as soon as they arrive (rather than being in boxes for a while until we get around to pricing them). Books in the front room that have not yet been priced are, surprisingly, one of our biggest sellers.